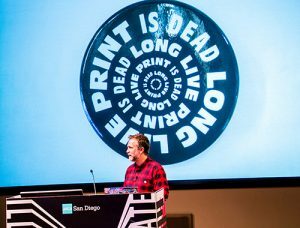 “PRINT IS DEAD LONG LIVE PRINT,” was one of many signs Facebook’s Global Design Lead and Studio Manager Scott Bom, featured. 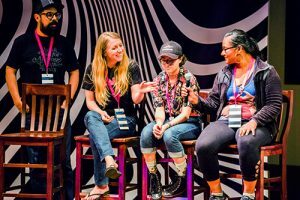 Sign painter and self-proclaimed comedian, Bom told the audience that yes, people do stay at jobs for money and recognition, but our impact and focus should be more about lifting others — in that way we rise. He showed us the Facebook Campus and what he and the creatives working in the analog lab were designing. After his presentation, many in the audience agreed that he might possibly have the greatest job in the world. 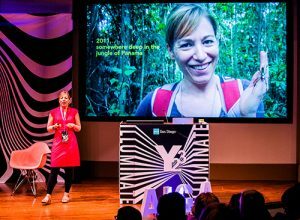 Preventing bird strikes and overcoming the fear of spiders opened the topic of biomimicry, as speaker Michelle Fehler, professor at Arizona State University took the stage. 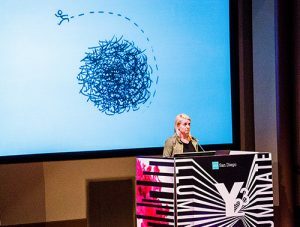 Ten years ago, Fehler attended AIGA-SD’s Y13 as a graphic designer. 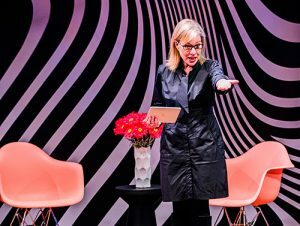 At the event she learned about biomimicry – the study of how visual communication can follow nature’s laws. She decided to make it the focus of her career. 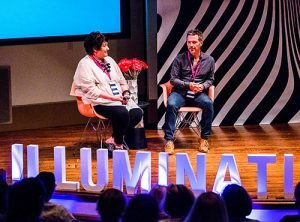 Now working on a second master’s degree and teaching at ASU, Fehler inspired the audience to think about how creatives can work in tandem with nature in bigger and better ways. 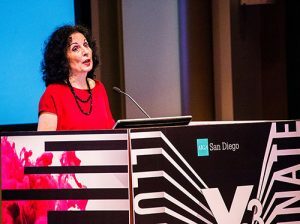 “The perfect job is the one you make for yourself,” said Louise Fili. In the world of design, Fili should need no introduction. An Italian-American graphic designer, Fili is renowned for her elegant use of typography. She explained that she was happy in the U.S. because as much as she loves all things Italian, as a female, the opportunities in Italy would have been very limited. Yet, Fili starts her client meetings sharing cups of gelatto. “If that doesn’t work, then they shouldn’t be my clients,” she laughed. Do you have or know young creatives in need of direction? 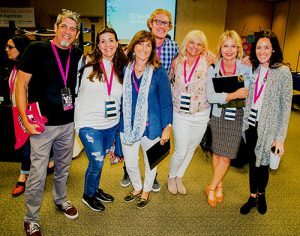 Get to know Karen Morrison, director of the AIGA-SD LINK program ! Morrison got on stage with a two LINK students who gave testimonials about how the LINK program lit up their lives. A visit from a famous Hollywood make-up artist was showcased and students learned how to apply life-like zombie make-up! After Saturday night’s gala at the Silver Gate Yacht Club, day two of Y23 began with Millman introducing Deborah Adler. Enter the wide, wide world of design beyond our desks. Adler, who had the good fortune to work for many years along side of Milton Glaser, had a personal experience motivate her to “use design in order to make people’s lives easier and safer.” Did you know that there are 53 ways to understand how to “take one tablet a day?” She decided that pharmaceutical regimes can be overly complex and came up with a system designed for both prescribers and pharmacists. The idea was picked up by CVS. Start small, specialize, and you never know where your creativity can lead. 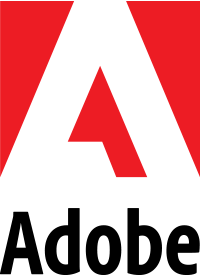 Adobe Sr. 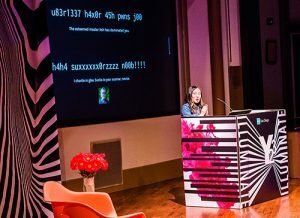 Product Marketing Manager on the new Adobe Creative Jam Enterprise team, Vanessa Dewey, worked through major design “hairballs” at Mattel, Inc., for years. She shared how to find your home as an in-house designer through culture, connections and community. And play. Play indoors, play outdoors, but don’t forget to play. Hometown hero Don Hollis enlightened us with his story — from managing a Wendy’s to building a successful business as an environmental designer. Think of downtown San Diego: the new SDG&E building, HUB in Hillcrest, Tower 21 and the Hard Rock Hotel. What do they have in common? Hollis Brand Culture. Former AIGA-SD President and current board member David Conover creatively introduced the final Y23 speaker. Self-proclaimed introvert and wine connoisseur, Matthew Santone, the “Wizard” of Argo Design, straight outta the heart of Texas. Santone blasted the light on AI (Artifical Intelligence), what he calls “the replication of human cognition.” Its purpose? To deliver and drive knowledge. Its aboutness? 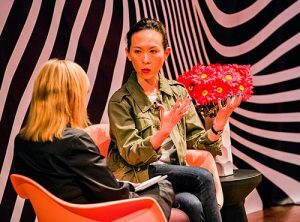 As a brainstorming partner, AI looks at massive amounts of data and helps make connections. Santone gave us the simile of squirrel behavior. “The average squirrel will bury about 10,000 nuts during any given year. They can remember each place and the type of nut that was buried there. Today, AI works like a squirrel’s brain. It has a specialized intelligence. 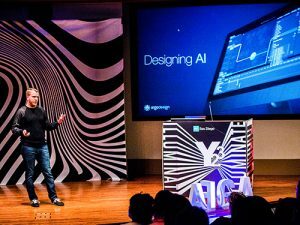 Tomorrow AI may be more like us — having a general purpose intelligence.” We must choose to use AI wisely, Santone intimated, and design will likely play a large role in its future. A spotlight directed here on Amy Levine, partner and designer at Visual Asylum, and long time producer/director of all things “Y”. 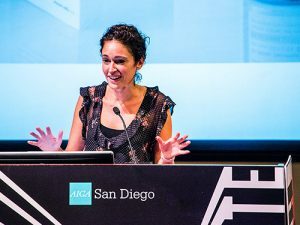 Thanks to Levine and past and current AIGA-SD board members, the Y conference again brought San Diego world-renowned speakers in the fields of design to light up the stage. Attendees got a look back in design time, a look forward to its possible future, and perhaps, a a chance to look in the mirror, where (paraphrasing Elizabeth Gilbert in Big Magic), “you begin to create what causes a revelation in your heart.” If you’re a dedicated designer and creative, don’t ask “how?” Attend the next “Y”.